FT Fitness Club, on the 2nd floor of Rimping Supermarket, next to Novotel Chiang Mai, officially opened its doors with Khunying Raveephan Sucharitakul presiding over the opening ceremony. Khunying Raveephan Sucharitakul cut the ribbon to the cheers of management and staff. Every station is equipped with a TV to make the time pass quickly. While touring the club through the spotless locker rooms, luxury shower rooms and a quick stop at the sauna, we were told about the courses offered, including ideal ones for beginners as intro aerobics, intro step or Yoga, which FT offers as a combination of meditation and stretching techniques that promotes overall wellness for body and mind. Facilities at FT Fitness were shown by (from left) Phannarai Vorasuntharosod, vice-president FT Fitness; Sunpetch Soratorn, Managing Director and Satuchet Raungdessuwon, the health club manager. 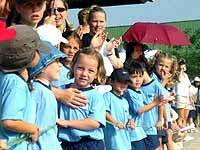 But the advanced sporting person will also find a huge variety of group sports. Power Combat, a program developed from a range of self-defenses, such as boxing, karate and tae kwan do, which aims to simultaneously train the whole body with a focus on endurance, strength and flexibility. The younger generation will probably prefer Hip Hop or Aero Jazz (combination of aerobics and jazz dance), while ladies and seniors might want to look at the A.B.T. (Abs, Butts, Thighs) classes, which are designed to tone up the lower half and are perfect for all fitness levels. But no matter which program is chosen, the trainers at FT Fitness assured everyone that it will improve your energy, overall performance and let members look and feel their very best. For more information on promotion membership rates, times or facilities, you are invited to drop by at the fitness center, or call 0 5341 0356. 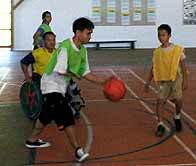 A group of 20 adults from the Yard Fon Vocational Rehabilitation Center for the Disabled at Maetaeng have begun a series of sports interactions with the Prem Tinsulanonda International School. On the first visit, Yard Fon teams played table tennis, snooker and basketball against Prem IB (International Baccalaureate) students. This turned out to be a great success and very enjoyable for everyone. Prem students quickly realized that the Yard Fon visitors were excellent sportsmen and women and that competitions against them would be very strenuous. Prem facilities are useful for the group from Yard Fon because they are able with relative ease to make use of the pool, gym and outdoor basketball court as well as the snooker and table tennis area. The Yard Fon supervisors are happy that their charges are able to interact with others from outside their own facility. It is important that at the end of their year at Yard Fon, they will be ready to re-enter general society where everything is not always set up for disabled people. At Yard Fon, residents from the age of 25 years do a one year vocational course to help fit them for independent living. Prem students, working for their service requirement for the IB Diploma, signed up eagerly for the Yard Fon project. They have planned eight visits covering as many sports and activities as possible. They were delighted with the first encounter and now feel they have to work harder on their own fitness to keep up with the visitors. At Yard Fon, the residents play various sports to a high standard. Many of the Thai teams for the Asian Special Athletes’ Games begin at their facility. On this occasion, the Yard Fon handicapped students came to Prem when the honorary chairman of the board of governors, HE Prem Tinsulanonda visited the school, with chairman ML Tri Devakul, accompanied by General Surayuth Jullanont, the recently retired supreme commander of the armed forces. It was wonderful for these dignitaries to witness one of the school’s service programs in action, as they are strong supporters of the International Baccalaureate and what it asks of its students. Interaction with the residents of Yard Fon is an ideal service activity, as the IB philosophy demands that service work be of a real and practical nature and that it has meaning for those who take part and occurs within a community context. Towards this end, the Yard Fon project fits perfectly. Deputy Prime Minister Jaturon Chaisaeng presided over the opening ceremony of the friendly football matches organized to celebrate the 40 years anniversary of Chiang Mai University (CMU). Deputy PM Jaturon (2nd row standing 4th from right) with the Mass Media team and CMU VIP’s team during the friendly match at CMU. The deputy PM also played in the special matches of CMU VIP’s team and the Chiang Mai Mass Media team at the CMU central stadium. Deputy PM Jaturon played for the Green team from Suan Dok as well, made up of alumni from the faculties of Health Science, Medicine, Dentistry, Pharmacy, Medical Technical Medicine, and Nursing. The Greens were the final winners, being awarded the deputy PM Jaturon Chaisaeng trophy. The Blue team, from the alumni from Humanity and Social Science faculties were runner-ups. The Science and Technology Yellow team from the faculties of Science, Agriculture, Engineering, Agricultural Industry, Veterinary Medicine, Architecture, and Fine Arts received the CMU council president’s trophy and the Mass Media team won a trophy from Assist Prof Dr Nipon Tuwanon, the president of CMU. 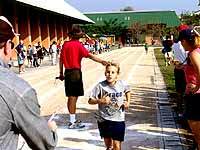 On Saturday, 13 March 2004, the Chiang Mai Hash House Harriers and the Irish Pub are having a Charity Fun Run to raise funds for the disabled kids of the Chiang Mai Disabled Center’s Wheelchair Clinic. Recipients will include children and young adults of all ages. It shall be a cross-country run, with a walk for those who cannot run. A fee of B.500 will be charged, which includes a free special events shirt, a free Guinness (for St. Patrick’s Day) at the B stop, free beer after the run, free soft drinks, free BBQ after the run at the Irish Pub, with beer, and spot prizes and lucky draws. The run is open for everyone, individuals, families, and teams alike. Company teams are very welcome to participate - assist a worthy cause, wear your own corporate outfits, and promote your business at the same time. The run itself shall be set by HHH Hares, and shall be across easy-running and beautiful Chiang Mai countryside. The organizers hope to make this an annual event, to support a great cause and have a good time as well. It’s also a good chance to see how the Hash House Harriers of Chiang Mai operate. Good time guaranteed, and some transport will be provided. For more information or registration, contact “Kiwi” at Fish & Chip Shop, Ratchawitti Road (opp. Irish Pub Sandy), on 053 418 210. This past Saturday junior school students from around the area and their parents gathered at Prem’s outdoor track and field for a morning filled with sprinting, throwing, jumping and a whole lot of fun. Participating schools included Prem, GIS, NIS, LIST, CMIS and APIS. The crowd was enthusiastic throughout and cheered loudly for every race, from the kindergarteners’ 60m sprint to the ever-popular parents’ races at the end. The crowd shows their enthusiastic support. 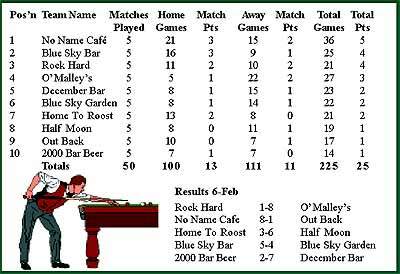 Final point scores placed Prem in first with 747 points, followed closely by GIS with 559, NIS with 187 and LIST with 176. When these scores were combined with the Senior CMAC track meet scores from last November, Prem came out ahead with 1505 points, followed by GIS with 1123 and CMIS with 627. The dads give it their best go at the 100M. All of the participating students, from the kindergarteners up through to the 5th and 6th graders, proved excellent competitors. The age champion for the Girls 5 and Under category was Jasmin (Prem), while Boys 5 and Under champion was Glen (NIS). Age 6 and 7 girls age champion was Sand (GIS) followed closely by Emily (Prem). Boys 6 and 7 champion was Danny H. (Prem). In the Girls 8 and 9 category Miriam (GIS) and Sam (Prem) both tied for first while Nathan (CMIS) lead the Boys 8 and 9 group. The older girls sprint ... Look at them go! Gift (Prem) had an outstanding meet, taking first in the girls 10 and 11 age group and setting a new CMAC record of 1:10 in the 400m race and another record of 2:55 in the 800m. In the boys age 10 and 11 category, Kurt (Prem) lead the group, setting three new CMAC records by running the 400m in 1:06 and by throwing the shot put 7.44m and the discus an incredible 21.24m. Wait for me! 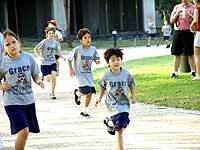 Prem kindergartener Crawford runs his hardest. Not only did all of the students participating show great effort and determination; they also made a lot of new friends and demonstrated excellent sportsmanship. Everyone who attended the meet thoroughly enjoyed themselves and cheered on every competitor, from the youngest kindergarteners’ right up through the (less cute, but just as determined) participants in the parents’ races. Grace International School was well represented at a track meet held at Prem International School on Saturday, Feb. 7, with kids as young as 4 and old as 11. GIS’s contingent was 60 kids strong. They battled in the long jump, high jump, shuttle relay races and 100-meter relay races. There was shot put, discus, 60, 100, 200, 400 and 800 meter races. The excitement began at 9 a.m. and continued past noon. Kids were everywhere, many with parents to cheer them on! Prem’s excellent track and field facilities made the day a huge success. Many kudos and congrats to all the organizers at Prem. Thanks also to the athletic directors of the other schools present - GIS, APIS, CMIS and NPIS - many worked very hard to assure a great experience for the kids. Thank you and see you again next year! Katie Duong, Bible Summetikul, Tobias Nosten and Amber Keele take a warm-up run for GIS kids around the track. Vivian Overholt from GIS crosses the finish line in the 800-meter girls’ 8-9 years olds with a well deserved 2nd place. 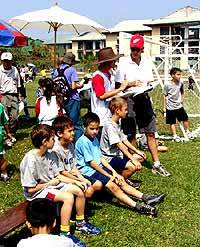 Tobias Nosten (GIS) and Corey Cole (GIS) sit with friends and competitors from CMIS and Prem. Veerasak Wongmalee of Chiang Mai won the low net score at the 2 day Blue Canyon amateur golf championship in Phuket last weekend. The two rounds were played from the black tees at the prestigious course, which was also the home to the Johnnie Walker Classic in 1994 and 1997. Golfers from Asia, Europe, Scandinavia and America were attracted with Nike as the primary sponsor. 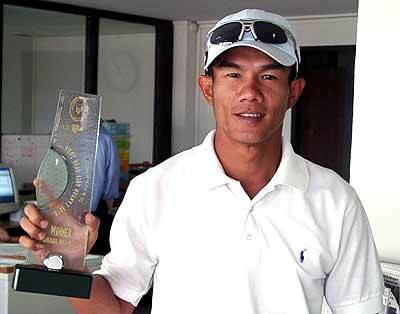 Veerasak Wongmalee, a member of Lanna and Green Valley Country Club was the surprise winner of this tournament.